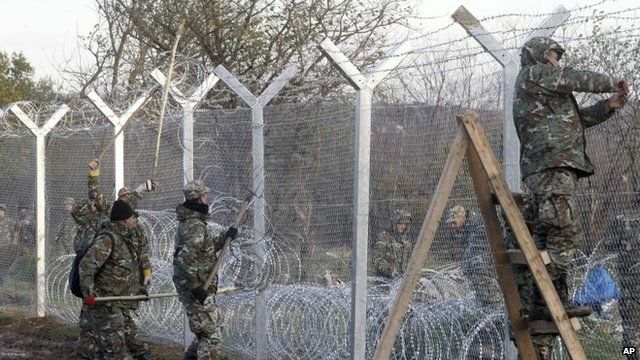 Clashes as Macedonia erects border fence Jump to media player Macedonia erects a fence on its border with Greece to limit the flow of migrants to the country. Protests mount at Macedonia's fence with Greece Jump to media player The Macedonian army has started reinforcing a metal fence on the country's southern border with Greece at the point where migrants cross on their way to western Europe. Migrants 'stuck' on Greece border Jump to media player Thousands of people are stuck on Greece's border with Macedonia because they are being told that only those that can prove they are escaping war Syria, Iraq and Afghanistan can pass. Macedonia 'worst place' for migrants Jump to media player Macedonia is one of the "worst places for migrants in Europe" according to several human rights groups. Gunfire as Macedonia police killed Jump to media player Police in Macedonia are continuing to search a town close to the border with Kosovo following a day of clashes with unidentified gunmen that left five policemen dead. Desperate for a train into the EU Jump to media player Hundreds of people wait in Macedonia for a train that will take them to the north of the country, from where they hope to continue into the European Union. Macedonia has become the latest country to restrict the flow of migrants entering the country, erecting a fence on its border with Greece. The International Organization for Migration (IOM) says 105,000 migrants have passed through Macedonia from Greece in November alone. Clashes have been reported between some of those stuck at the border and police, while a number of Iranian men have sewn their lips shut in protest at not being allowed to continue. Guy Delauney reports from Belgrade.